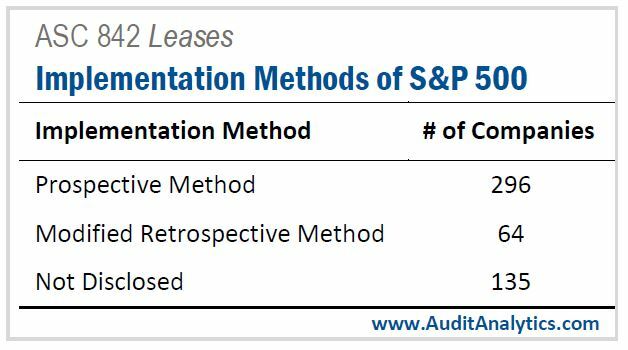 The new lease accounting standard, ASC 842, is now effective, but we see that public companies are only slowly progressing toward adoption. 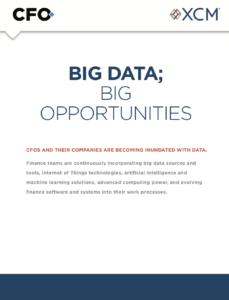 The analysis below is based on information in filings by S&P 500 companies between October and December of 2018. Only two of the companies — Microsoft and Target — early-adopted the new standard in 2018. As of Dec. 31, 483 companies were still evaluating the standard, while 10 companies made no disclosure on the matter. All of the companies must file their first financials prepared under the standard for the first quarter of their fiscal year that begins in 2019. That means companies with a calendar fiscal year must do so for the quarter ended March 31, 2019. It’s still possible that some companies with non-calendar fiscal years will still early-adopt, but it’s relatively unlikely, given the rule’s complexity. Six companies disclosed that the standard will affect their internal controls over financial reporting (ICFR), while 91 companies (18%) disclosed that they will adopt new software to implement it. The standard does allow for certain simplifications; so far about 150 companies have indicated they plan to use these practical expedients to reduce the cost and complexity of implementation. The Financial Accounting Standards Board (FASB) issued the standard in February 2016, although it didn’t become effective until this year. Private companies are subject to it one year after the effective dates for public companies. The rule says companies must recognize lease assets and liabilities on their balance sheets. According to FASB, the new standard should improve financial reporting of leasing transactions. Previously, companies did not have to report operating leases on the balance sheet, raising the argument that for some companies, liabilities might be underestimated by billions. The outstanding lease commitments were typically disclosed in the footnotes to financial statements. The new presentation is more transparent from the investor’s perspective. The new rule affects both lessors and lessees. Before they implement it, these entities must evaluate its impact on their business processes, financial statements, and internal controls. Under the previous accounting rule, ASC 840, a lease was defined as an agreement conveying the right to use property, plant, or equipment. While the new lease definition sounds simple, it’s actually a big change and an accounting and operations challenge. The standard applies to large items such as office space or cars, but also to small things like leased equipment or even software. 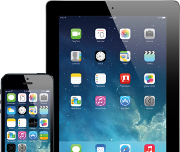 Most companies will have to install new software to properly track the leases. Failure to do so could cause internal controls to be ineffective and, in some extreme cases, if a material lease was not accounted for properly, it may even cause financial statements to be incorrect. To implement the standard, companies can follow either a “prospective” method or a “modified retrospective” method. The latter method requires the restatement of previously filed financial statements. It provides comparability between periods; its disadvantage is high implementation costs. In June 2018 FASB issued a simplification update, ASU 2018-11, that allows companies to not recast previously filed financial statements. Instead, using the prospective method, they can elect to record the standard’s impact as of the adoption date, which is January 1, 2019 for calendar year-end companies. Not surprisingly, more than half of the examined companies have already indicated that they plan to use the relief provided by FASB. Many have not yet indicated what they will do, but it’s safe to assume that the number of prospective applications will increase as companies’ implementation deadlines approach. We expect the standard will have a material balance sheet impact on about 80% of companies, particularly on right-of-use assets. At the right we list the type of policy impacts ASC 842 may have on companies. In addition to the impact on accounting, the new rule will have a substantial financial impact on public companies. It will add millions of dollars in liabilities, and in some cases billions, to corporate balance sheets, where liabilities and debt offset assets. Other areas analysts and investors should look at for possible impacts are expenses, debt covenants, and capital ratios. 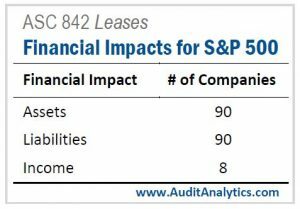 Among S&P 500 companies for which the new rule affects the balance sheet, we’ve seen an even split between impacts on assets and impacts on liabilities. The standard will likely continue to impact assets and liabilities equally for most companies, as it provides a right-of-use asset with a corresponding operating liability. Keep in mind, though, that how the rule affects balance sheets may change over time as more companies disclose. 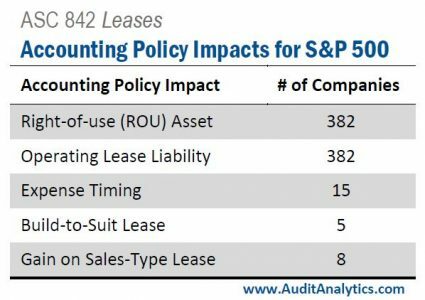 The recording of right-of-use assets and the corresponding operating lease liability are among the impacts that have been widely discussed and are mostly well understood. The discussion below primarily focuses on lesser-known provisions that may nonetheless be very material for some companies. A less common type of lease accounting applies to “build-to-suit” arrangements. Often seen in property leases, a developer builds according to a tenant’s specifications. These are sale-and-leaseback transactions, where a seller transfers the asset to and then leases it back from a buyer. The new standard makes significant changes to current build-to-suit rules. Many build-to-suit arrangements are unlikely to be considered leases under the new standard and will be off balance sheets. One example is Tesla’s solar-energy leases, which will now be accounted for under ASC 606 because they will no longer meet the threshold for lease accounting under ASC 842. Most loan covenants are written based on the GAAP rules in place when the loan is created. If a new GAAP accounting method is implemented, such as the new ASC 842 standard, debt ratios need to be recalculated. That could make it more difficult for companies to borrow money. It could lead to some companies needing to renegotiate loan terms or maintain another set of books. That means until the loans are due, they would need to run special reports for their creditors using the GAAP rules that were previously valid under the loan terms, but not under current GAAP rules that include the new ASC 842 rules. The new standard will affect bank capital ratios, which establish to the amount of money regulators require banks to hold. Intangible assets are deducted from bank capital ratios, while tangible assets are not. There is no specific guidance under ASC 842 on whether right-of-use assets are considered tangible or intangible assets. Deloitte suggests banks look to how the Basel Committee on Banking Supervision regards right-of-use assets. Basel considers right-of-use assets tangible because the underlying asset is tangible and should be risk-weighted at 100%. “At adoption, we expect to have a cumulative effect adjustment of approximately $140 million to increase retained earnings related to deferred gains on our prior sale-leaseback transactions. The calculation of our operating lease right-of-use assets and liabilities, for approximately 7,000 leases, are expected to be $5 billion and $5.6 billion, respectively, and will continue to be refined as we complete our implementation process. Olga Usvyatsky is vice president of research at Audit Analytics. Derryck Coleman is a research manager and Guillermo Aznar-Muzas a research analyst at the firm. Note: This article was first available to subscribers of “Accounting Quality Insights by Audit Analytics” on Bloomberg, Eikon, FactSet, and S&P Global. One point of clarification. In the second last paragraph of the Overview section you mention “even software” could be considered a lease. This is not entirely true. Arrangements that convey rights to use intangible assets (such as those involving software licenses) are outside the scope of ASC 842.